Who invented the Assembly Line? The name of the person credited with inventing the Assembly Line is Ransom E. Olds (1864 - 1950). Ransom E. Olds is not only famous as the American inventor of the Assembly Line but also as a businessman and entrepreneur. When was the Assembly Line invented? Ransom E. Olds invented the Assembly Line in 1901, during the Second US Industrial Revolution period of invention (1850 - 1914). The invention of the Assembly Line originated in America and is considered a leading achievement in the field of Business and the automobile industry. Definition of the Assembly Line: The Assembly Line is defined as a quick, efficient, mechanical system used in a factory (also called a production line) in which an item is mechanically conveyed through various areas and sites where successive operations and assemblies are performed to produce the completed product. Fact 1: Who invented the Assembly Line? The Assembly Line was invented by Ransom E. Olds in 1901 during the Second US Industrial Revolution era of inventions (1850 - 1914) which was a foremost addition to advancements made in the area of Business and the automotive industry. Fact 2: Who invented the Assembly Line? Prior to the invention of the Assembly Line in 1901, the manufacturing process was extremely slow and labor intensive. Fact 3: Who invented the Assembly Line? The inventor of the Assembly Line, Ransom E. Olds, was born on June 3, 1864 in Geneva, Ohio, United States and died on August 26, 1950. Fact 4: Who invented the Assembly Line? Ransom E. Olds was a great businessman and energized to such an extent that he was destined to become acclaimed as the American inventor of the Assembly Line, also known as the Production Line. Fact 5: Who invented the Assembly Line? The early years of Ransom E. Olds were spent in Geneva, Ohio, United States where he was raised by his family. His parents were Pliny Fisk Olds & Sarah Whipple Olds and he was the youngest of three brothers. His friends and family affectionately called him "Ranny". Ransom E. Olds was educated at basic education and did not undertake higher education at a University, in fact he was a High school Drop out. Fact 6: Who invented the Assembly Line? He was fascinated by new technology and spent his early years tinkering with engines. His father ran a blacksmith forge & store called "PF Old's & Son" and following his education Ranny's first job was working in the family store and learning to become a mechanic. He built his first steam car in 1894 when he was thirty years old and went on to produce gas & electric cars. Fact 7: Who invented the Assembly Line? Ransom E. Olds was an ambitious man and by 1897 he had co-founded the Olds Motor Vehicle Company and relocated to Detroit. The company was renamed as Oldsmobile (and would later become a part of General Motors). The company built the prototype of the Curved Dash Oldsmobile in 1900. Fact 8: Who invented the Assembly Line? The production of the Curved Dash Oldsmobile was critical to the survival of the company. Olds knew that the key factor to success in the rapidly expanding automobile business was to produce cars as quickly as possible. He had observed the working process of making a car and believed that he could speed up the process. Fact 9 Who invented the Assembly Line? Most companies at this time produced several styles of automobiles, and Oldsmobile was no different. However, on March 9, 1901 a disastrous fire broke out at the Detroit company destroying a number of other models before they were approved for production. The Curved Dash was the only automobile that was left intact. Fact 10: Who invented the Assembly Line? He introduced a new process he called "Progressive assembly", using interchangeable parts and castered stands that could be moved from place to place to improve the speed of manufacture and production. Ransom E. Olds shrewdly patented the Assembly Line concept in 1901. Fact 11: Who invented the Assembly Line? Ransom E. Olds converted the undamaged parts building to a temporary assembly factory and initially purchased parts and engines from the Dodge Bros. company. Fact 12: Who invented the Assembly Line? Switching to the "Progressive process", or Assembly Line, allowed the Oldsmobile company to increase output by 500% in just one year. The company was able to produce the Curved Dash model at an exceptionally high rate of 20 units per day. The 1901 Oldsmobile Curved Dash was the first mass-produced automobile. Fact 13: Who invented the Assembly Line? A new factory was built in Lansing, Michigan and production of the Curved Dash increased still further. Ransom E. Olds then established the "supplier system" to order large shipments of assembled parts from outside companies to meet production demands. The Assembly Line saw the output of the Oldsmobile Curved Dash increased from 425 cars in 1901 to 2,500 cars in 1902. Fact 14: Who invented the Assembly Line? Unfortunately Ransom E. Olds made the wrong choice in his business partners who, after several disagreements, gained control of the Oldsmobile company and retained the 'Olds' name. Furious at this kind of treatment Ransom left Oldsmobile in 1904. Fact 15: Who invented the Assembly Line? Ransom E. Olds was determined to get back into the automobile business and almost immediately founded the REO Car Company in 1904 in Lansing, Michigan. He could not use the name 'Olds' so he used his initials (REO) instead, and ensured he retained 52% of the stock in the new company. Fact 16: Who invented the Assembly Line? By 1907 Ransom E. Olds had built the REO Motor Car Company into one of the leaders of automobile industry, with a 25% market share, but after 1908 the company steadily lost ground to its competitors, including the Ford Motor Company. Fact 17: Who invented the Assembly Line? Henry Ford developed the Assembly Line technique, pioneered by Ransom E. Olds, and applied it to the mass production of his Model T automobiles. Henry Ford improved upon Olds’s idea by installing conveyor belts on his Assembly Line. The moving platforms of the Ford conveyor system enabled the chassis of the vehicle to be towed by a rope that moved it from station to station in order to allow workers to assemble each part. Ford's Assembly Line reduced the production time of a Model T car from 12 hours 8 minutes to just 1 hour 33 minutes. Fact 18: Who invented the Assembly Line? By 1915 Olds turned most of his attention from the automobile business and the Assembly Line to other activities including banking, politics and automobile racing. Fact 19: Who invented the Assembly Line? 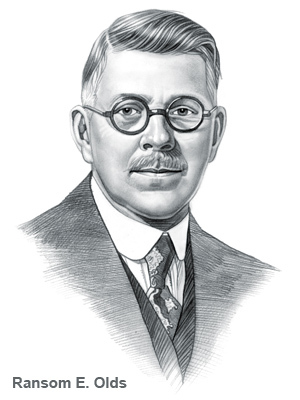 Ransom E. Olds was inducted into the Automotive Hall of Fame in 1946 for the invention of the Assembly Line. He died on August 26, 1950. Fact 20 - Impact: How did the Assembly Line impact the world? The impact of the invention of the Assembly Line was a tremendous step to improving the field of Business and the automobile industry. The adoption of the fast, efficient production system reduced manufacturing costs and made the automobile available to ordinary people.